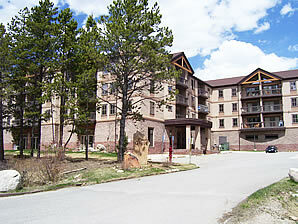 A fifty unit four-story condominium complex located in Keystone Colorado. Construction is pre-stressed concrete & frame. The exterior is stucco and the roof is asphalt shingle. The building is served by a common entry that accesses two elevators and a handicap lift. Units are accessed by common hallways on each level. Common areas include an attractive lobby area, an indoor pool with hot tub, an exercise room, laundry rooms, ski locker storage rooms, vending machines and a parking garage on the east end of the building. Exterior grounds are made up of attractive lawns, improved flower beds, natural areas and exterior parking. The Oro Grande Lodge Association carries Association Insurance through Farmers; please be sure that you have individual coverage for your unit. Please feel free to contact Farmers Insurance direct at 970-879-1330 should you have any questions. The next Oro Grande Lodge Board of Directors meeting will be held April 16th, 2019 at 9:00 am. The Annual meeting will be held on Saturday, November 2nd, 2019 at 2PM, at Oro Grande.